Kane is the double winner on the weekend. – Jansen Allen and Hiroshi Shimizu were both extended to tiebreakers against Alok Mehta and Juan Salvatierra respectively but advanced. – MoMo Zelada made it twice in two months over Georgian Maurice Miller 11,10. Miller subsequently caught fire in the Men’s Open draw, racing to the final with a number of what i’d characterize as “Career Best” wins. – David Horn got a solid win over Eduardo Garay 10,11. The 32s were played Friday morning, with a couple of “upsets” by seeding and a couple of tie-breakers. – #9 Jose Diaz dropped the first game to long-time IRT veteran Hiroshi Shimizu but recovered to take the match. Shimizu looked pretty darn good for someone who is north of 50. – The 16/17 match, as always, was a tight one, with Felipe Camacho coming out on top of Thomas Carter 11-8 in the breaker. A close match. – Eduardo Lalo Portillo blasted Jake Bredenbeck 5,8 to advance in the upset by seedings. We know Portillo is no slouch and this win doesn’t surprise me, but the score does. Jake is definitely in a rut this season. – Rodrigo Montoya blitzed by countryman Gerardo Franco Gonzalez 15-1, then dropped the second game before racing to the tiebreaker win. Final score: 1,(10),3. 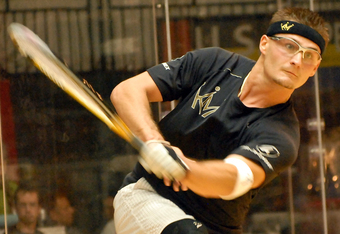 – In the 15/18 match, Adam Manilla won the lefty-on-lefty crime match, topping Robert Collins in two tight games 13,11. – In the 8/9 match, Sebastian Franco turned the tide on his results lately and took out Jose Diaz in two tight games 12,12. – #4 Alejandro Alex Landa took out the upset-minded Eduardo Portillo 5,12 to eliminate the highest advancing seed out of the 16s. – In the biggest upset of the night, #14 Montoya took out #3 Daniel De La Rosa with relative ease 3,9. While these two are neck and neck in true world power rankings … DLR has had the better of him lately, including a shellacking in Sioux Falls two months ago. Surprising result for me … and opens up the draw for Rodrigo completely. – #7 Samuel Murray dominated #10 David Horn 3,7. I thought this match might have gone the other way … but a 3,7 win is pretty convincing. So your seeds into the quarters are 1,2,4,5,6,7,8 … and 14. Pretty chalk. But i’m guessing that 14 seed may make some more noise here. – #1 Kane Waselenchuk let #8 Sebastian Franco hang with him til about 6-6 in the first, then ran off more than 20 unanswered points, winning the first game 15-7 and donuting the Colombian 15-0 in the second. – #5 Andree Parrilla continues his dominance at this event (his two best career finishes are at this event over the last two seasons), cruising to a win over #4 Alejandro Landa 8,9. Parrilla has beaten Landa now twice in a row, improving his career h2h record against the former #1 to 4-6 across all competitions. – #14 Montoya made it 3-0 against Alvaro Beltran on the IRT tour, taking this match and beating the #6 seed 8,9. Montoya advances to his 3rd career IRT semi final (out of 8 career IRT tourneys) and second this season (he made the Semis in Sioux Falls after beating #1 seed Landa in the 16s). – #2 Rocky Carson dropped a game to #7 Samuel Murray for just the second time ever, but Murray ran out of gas in the tiebreaker and lost a 2+ hour marathon 7,(13),2. – Kane blitzed by Parrilla 5,2, never really giving Andree a chance to junk ball his way into the match. – Carson took the first ever meeting against Montoya 11,2. The first game was a shot-maker’s paradise, with the players going toe to toe and firing at all cylinders. In the second game, Carson put on a master class of game management, completely controlling the match and bewildering the young Mexican to a crushing 15-2 defeat. Make no mistake; there is still a gulf between the 2nd ranked Carson and his challengers. – Kane won a match that he really controlled throughout by the not-as-close-as-it-looked scores of 10 and 10. Lots of lob serving from Kane, who put in twice the court time he normally does this weekend and may have been conserving his arm by not drive serving in the title match. – Kane captures his 115th career IRT Tier 1/Grand Slam title. – Kane improves to an amazing 75-3 against Rocky, the lions share of which were tournament finals. – Kane raises his current match winning streak to 82 matches, good for 3rd best ever streak. He’s got a long way to go to top his record of 134 straight. – Kane extends his current GAME winning streak to 72 games, and moves into 2nd place all time to his own 113 game winning streak that I previously thought was his career achievement. He’d have to win 21 more matches w/o dropping a game to top it, or probably 6 more tourneys… and there’s no end in sight to his current dominance. – Kane now has a nearly 500 point lead … and still has one more tournament to play without defending any points from last season’s injury, which means a win in Bolivia and its double points would lead to a nearly 900 point advantage with just two events left. Which means … if Kane wins in Bolivia he’s clinched the title. – Landa and DLR should switch places with DLR’s early upset. – Beltran should rise to #5. – Franco should rise to #6. – Parrilla drops from 5 to 7 despite making the semis. – Murray drops from 7 to 8. – Horn drops from 10 to 13. – Montoya rises from 14 to 12, meaning he’s away from the top 3 in terms of a potential round of 16 match-up now. He’d now project to play the 5th seed in a round of 16, which gets him away from the top 4 players and just increases his chances of gaining more rankings points. No upsets in the full round of 16. In the quarters, in the 4/5 match-up Jake/Diaz got a solid win over Montoya/Parrilla, and the 6th seeded favorites Kane/Croft “upset” the 3rd seeded Colombian pairing of Mercado/Franco. In the semis, DLR/Alvaro got a solid win over Jake/Diaz, while Kane/Croft got an injury-driven walkover win against #2 seed Landa/Murray to setup the final everyone wanted to see. In that sat. night final, Kane/Croft recovered from losing the first game to out-shoot DLR/Beltran and improve to 4-1 head-to-head against the reigning World Doubles champions on the pro circuit. Thats it, thanks for reading! Next up is the Bolivian Grand Slam. Can’t wait to see this event, since there’s 5-6 really quality Bolivian players who we rarely get to see. Moscoso, the Keller brothers, Ruiz Michel, Gerson, Garcia, Mercado and Carrasco all could be in this draw and make noise. Maybe even the legendary Ricardo Monroy could come out of “retirement” to play; if you’ve never heard of Monroy, he was the first non-North American international player to win a major IRF title, taking the 2010 Pan American Championships. And there’s also a Women’s pro stop, with lots of quality Bolivian female pros too.